My buddy Paul Weeks and I drove from Seattle last Friday night and arrived at Crater Lake around 3AM. This gave us just enough time to snowshoe out for some predawn and sunrise shots. The next day we ended up hiking a few more miles and camping on on the top of the Watchman Lookout which gives a full view of the lake from above. 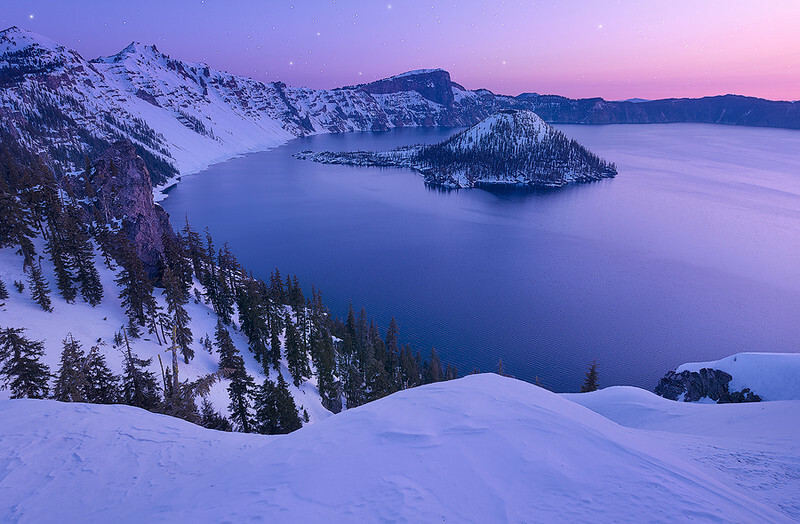 This time of year at Crater Lake is amazing as there are hardly any people up there. As far as shooting goes I took 2 shots for depth of field, and another shot for the stars about 30 minutes before the other 2 shots. The (2) focus shots were blended by hand in Photoshop for depth of field, and the shot for the stars was blended using Photoshop Lighten Blend Mode with a few extra adjustments.